Intel claims the 9900K is the world's fastest desktop CPU. What do you get when you pair that with an enthusiast Z390 board? The EVGA Z390 Dark was designed exclusively for high end overclocking with a unique PCB layout, VRM, and I/O. The board was influenced by top overclockers and no feature was overlooked. We will be focusing on an overclocking guide with the new Z390 Dark & 9900K. I want to show how easy overclocking can be and show some pointers for the enthusiasts or beginner. Overclocking the 9900K will allow us to squeeze extra performance from the CPU, and from my experience, we should expect a respectable overclock. The Z390 Dark should allow us to achieve better results due to its unique layout and special features. 9900K and allows for real-time changed to your SA/Ring voltages. The largest improvement with the 9900K is the move from thermal paste TIM (Thermal Interface Material) to a soldered interface under the IHS (Integrated Heat Spreader). The i9-9900K provides clock speeds up to 5GHz (Turbo 2.0) with improved power requirements. Intel Turbo Boost Technology 2.0 Dynamically increases the processor frequency when applications demand more performance. With the Z390 Dark, we should be able to control/overclock the 9900K through specific voltages and the enhanced VRM. The EVGA Z390 Dark is limited to two memory slots and includes a VTT DDR rail. We should expect better memory overclocking and less strain on the IMC (Integrated Memory controller). 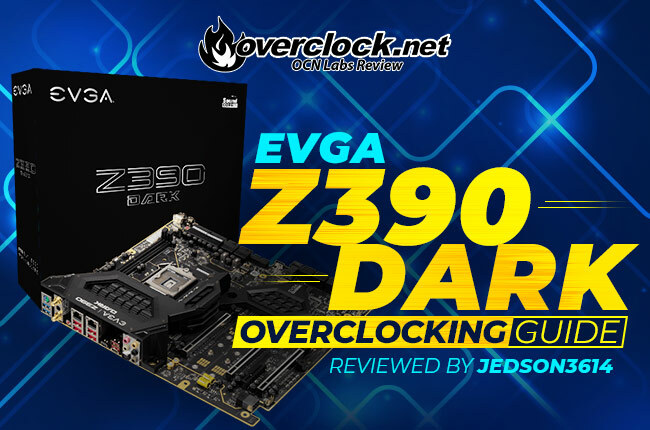 The EVGA Z390 DARK sets the standard for motherboards based on the Intel Z390 chipset. The Z390 chipset is connected and shared across a DMI(Direct Media Interface) 3.0 between the 9th gen CPUs and supports your PCIe 3.0 express as well as, USB 3.1, Optane support, Thunderbolt, Intel LAN, SATA 3.0, USB 2.0, SM Bus, and HD audio. With the Dark, you can also set physical switches to disable PCIe slots. Z390 isn't a huge difference from Z370 but does offer built-in USB 3.1 gen 2 and WiFi 802.11ac. If you're interested in seeing the improvements of Z370 look here. For convenience reasons, we will be overclocking the 9900K as far as possible with an AIO (All-In-One) cooler from CoolerMaster. You can expect much better results with exotic/custom cooling but AIO coolers are much cheaper and more desirable for everyday users. They can provide decent cooling for the price and are a good way for entry builders to get introduced to water cooling like performance. The best thing about this style of coolers is they are maintenance free. One of the reasons I chose the MaterLiquid 240 is because it has a TDP (Thermal Design Power) of 230W and decent PWM fans. It has a low profile dual chamber pump and the PWM fans are rated for 650-2000 RPM +/- 10%. Just a quick spoiler and heads up, you can probably get 5GHz with an AIO cooler if you have a golden chip and good fan curve. Don't expect miracles though as air/AIO coolers can only take you so far. Overclocking isn't an exact science and the silicon lottery plays a huge role in how much voltage and clock speed you can squeeze out of your chip. Also, the 9900K is known to run extremely hot because it really pushes 14nm ++ to its limits. The EVGA Dark should help here with its robust VRM and better memory overclocking potential. The Z390 Dark offers much better memory scaling with only two DIMM slots. This board is designed for higher frequency kits and I will be using TEAMGROUP's TFORCE Xtreem 16GB (8x2) (Latency 18-20-20-39 2T) @ 3600MHz kit. The reason these Xtreem series kits are good overclocking chips is that TEAMGROUP insists on using high-quality SAMSUNG ICs. They use a 10 layer PCB (Printed Circuit Board), which offers 25% more efficiency. Hitting 3600MHz on a board like this should be easy. I will attempt to try and push for higher frequencies considering I have more overclocking headroom. I don't anticipate much more than 3600MHz though, even with a moderate overclock on the 9900K. Why choose the EVGA Z390 Dark? The EVGA Z390 Dark was designed with pro overclockers in mind and offers features similar to its bigger brother the EVGA X299 Dark. It can take full advantage of the new 9th Gen Intel 8-core CPUs and offers a 17 phase VRM. It also comes with a visual bench table that is a replica PCB layout of the Z390 dark. It shows a breakdown of circuitry, LEDs, PCIe lanes, and includes standoff for proper clearance. The 17 phase VRM consists of 1 phase VSM for memory, 1 VCCIO, 2 for VGT, 1 VSA, and 12 smart ISL99227 power stages for VCORE. The VRM and chipset are cooled with a huge passive heatsink for providing adequate cooling for high efficiency. The heatsink gets cool air because the right side connectors, memory slots, and CPU have air passes over them and exhausts out the rear. The two DIMM slots are rotated 90° and offer 1 DIMM per channel which improves performance. This will impact memory timings and the DIMM slots are also surface (SMT) mounted for lower signal loss. The Dark also offers a controllable VTT DDR rail. These slots should work extremely well with our TEAMGROUP kit because they offer Samsung B-dies. The dark can support Up to 32GB of 4600 MHz+Dual-Channel RAM. The Z390 Dark is very unique because it's the first motherboard to offer both right-angle 24-pin and 2 8-pin CPU connectors on the side of the board. It offers a 10-layer PCB with multiple sensors to track a wide variety of temperatures and voltages. You can also set your dual LED displays to monitor specific items like CPU temperatures. The board offers a wide variety of I/O and Creative 5.1 Channel Audio + EVGA NU Audio for Headphones. lowest possible setting to allow users to switch between max OC and low speeds in real-time. Disclaimer: To start our overclocking adventure, I want to make a few things clear! Before you overclock your system, I can take no responsibility for any damaged hardware that may result from overclocking. There are risks involved with pushing your system further than its intended and also causes more system heat as a result. You will need adequate cooling for overclocking, and decent hardware to achieve anything good. Also, keep in mind that overclocking your system will vary across different types of hardware, and even using the same hardware I used may not provide the same results. a few quick stress tests or play a few games to make sure your system is running well. This can really help eliminate or reduce any problems that might occur after overclocking your hardware. First, get all your appropriate drivers installed and make sure your system is running the way it's intended to. PRO Tip: To enable the ultimate power plan, open a Command Prompt as administrator (CMD) and enter "powercfg -duplicatescheme e9a42b02-d5df-448d-aa00-03f14749eb61". This plan is perfect for gaming desktops or workstations. If you want better power saving features, then do NOT use this plan. It will run your CPU in maximum performance mode. To configure any setting in your UEFI hit the "Del" key to enter the environment. just want an easier method. overclock. Not all chips are created equal and sometimes manually overclocking can yield better results when tuning the right voltages and settings. "Jet engine approach" but fans at 100% RPM can be loud. It's good to try and strike a balance for idle vs load conditions. For the EVGA Dark, it offers a "SMART" setting that automatically uses PWM to adjust for fan speeds based on load conditions. I would say to leave "SMART" enabled but enter into each installed fan and adjust "Fan Control By" to "CPU Temperature" and set your Temperature/Speed levels to something tolerable. I would suggest: Default 30% Speed | 40(Temp)/60(Speed%) | 50(Temp)/70(Speed %) | 60(Temp)/80(Speed%) | 70(Temp)/Max(Speed%). I'm using an open-air test bench and having a 120mm Fan move air across the motherboard. For the MasterLiquid 240 pump, I just made sure it was set to 100% for better performance. The fans for the radiator are controlled by my fan curve. I am choosing to stick with an AIO here because they are still widely popular. I want to demonstrate what you can do with something more reminiscent of what a person might buy for a new build. Certainly, you can get much better cooling performance from a custom loop or exotic cooling choices. You'll notice in the second picture I have a clock speed of 5GHz with RAM at 3800MHz and this was the absolute limit I could achieve to get the system to post. NOt too shabby for using an AIO. The only major drawback here was CPU temperature. To start overclocking we will need to adjust voltages. This will vary based on silicon quality, cooling, and a bit of luck, hence the term"Silicon Lottery". There are a few ways to overclock but we are going to focus on multiplier overclocking and starting with XMP memory values. See below for a definition for each of my settings. The values I used are what worked for me, and are just a starting or reference point for others. Overclocking and voltage will vary from system to system so any values I suggest are just to help others try to achieve their overclocking goals and are not 100% guaranteed. 9900K, I need 1.28V for 5GHz. Although stable, I settled for 4.8GHz for more comfortable temperatures. AVX Offset: This setting reduces your CPU core frequency based on the negative offset during AVX workloads. This is actually useful for the 9900K when targeting all core frequencies over 5GHz. Most 9900K CPUs will not handle over 5.2GHz on average. Setting a negative AVX offset could help you run everyday clocks over 5GHz but reduce for AVX workloads. For my chip, I chose an offset of -2. It will hit 4.6GHz on all cores during an AVX workload since we set 4.8GHz as our normal CPU core speed. "-25% - Less droop" because it allows a good balance of target voltage (VCore) and temperatures. While under load it will only drop a small amount and help keep healthy voltage levels. I normally set my VCore a little higher than what the CPU is stable at so that the drop in voltage can stay within stable parameters. In my case, my 9900K is stable at 4.8GHz around 1.265V. I set 1.28V on VCore so that even a small drop stays around or above 1.26V. VSA (System Agent): This is important because it handles the IO between the CPU and other domains. For overclocking, this can help stabilize higher memory frequencies. I want to point out, 1.2 is a good starting point for a 3600MHz kit. If possible, do not go outside of 1.35V as a maximum. memory controller and the memory kit used. loose timings on the RAM but this required a few tricks that I will go over later. Memory Profiles (XMP Profile 1): XMP is a way memory manufacturers can sell faster ram rated for a specified speed. XMP speeds are still considered overclocking and are not guaranteed to work even when you buy a kit at a rated speed. This is because you put stress on the IMC and anything outside of Intel's default rated 2666MHz speed is considered overclocking. My TEAMGROUP kit is rated for 3600MHz @ 18-20-20-39 2T with a DIMM Voltage of 1.35V. DIMM Voltage: This sets the specified voltage (VDIMM) for your memory. This can be determined by XMP but typically high-speed kits are rated for 1.35V. The XTREEM kit I'm using requires 1.35V. I'm pretty impressed that the Z390 Dark could achieve 5GHz on this 9900K with the XMP profile of 3600MHz. This is a pretty respectable overclock in my opinion. If any of you guys don’t know Joe, he is a professional overclocker and always willing to help people out. He is well known as a legend in the HWBOT community and has smashed 100s of records. I’ve had the pleasure of meeting him a few times. He also owns a YouTube channel called “Bearded Hardware” which you can check out here. Joe has actually taught me quite a bit about memory overclocking and his opinions are definitely worth your time. I’m going to list some questions we went over, which provides some advanced memory overclocking tips for the Z390 Dark. These will be helpful if you're looking to squeeze every bit of performance possible. “Most benches don’t use that much memory so it’s a waste and it puts a strain on the memory when having high clocks”. “With this, you could push 4ghz if you have decent sticks”. “A1 or older style like lower freq and tight timings”. “A2 modules like higher freq and a bit higher cl”. Me: What benchmark utilities do you use? Joe: “Geekbench 3 Or superpi 32m”. “Geekbench is good with newer memory”. Me: What is your favorite memory brand? Joe: “G Skill!” “I love the tridents and royals haha”. Once all the settings have been changed to the desired values, it's time to save and exit the UEFI to test for stability. It is critical to test for everyday stability, otherwise, the infamous BSOD can occur. There are several tests available but which one should you use? I like to use a mix of testing tools\software. I prefer to use Aida64 Extreme, Prime95, and EVGA E-Leet X since it's compatible with the Z390 Dark. For testing load conditions we will be using a KILLWATT. This will help show what the load in WATTs is with each phase. I will test high (100%) / gaming / idle (desktop) conditions. For testing the NVMe performance of the Z390 dark we will be using AS SSD. This will help show the best possible read/writes you can expect with the Western Digital Black SN750. I will be looking at VRM temps with my FLIR ONE. The FLIR ONE tool is fantastic because it will allow tech enthusiasts and reviewers to show visual results for thermal testing. It is a next-generation thermal camera that works with iOS and Android devices. If you want to buy one look here. I'm using the new Pro Gen 3 model. ROG RealBench: Even though we don’t have an ASUS board we can still leverage this great utility. One of the things I love the most about RealBench is how much of a power load it puts on your system. For a well-rounded test of stability, RealBench is going to be your best choice. It aims to test real-world load scenarios with stress tests from Handbrake, Luxmark, and Winrar. Aida64 Extreme: Great benchmarking utility with several built-in system benchmarks. It monitors sensors in real time, it can gather accurate voltage, temperature and fan speed readings, while its diagnostic functions help detect and prevent hardware issues. This program also has a good built-in stress test utility for testing your overclock and looking for instability. Prime95: This tool is good for pushing your chip to its limits. It's a synthetic benchmark that pushes AVX workloads to the CPU. To really test the thermal limits of your chip you can run the small FFTs test. It is not normally recommended to run synthetic tests with the adaptive voltage on. This can result in much higher temperatures and pull more voltage than required for the CPU. Max temps of 80°C or below are very reasonable with an AVX offset of -2. I am running at 4.6GHz AVX all core and 4.8GHz all core for gaming and other non-AVX loads. If you want to test memory stability Prime95 also has a "Blend" test that will test everything but test more RAM. general overview of the CPU and motherboard information, including Socket information, CPU series, Core speed, and other CPU information. You can also monitor system temperatures, fan speeds, and voltages. This utility is a must for any EVGA motherboard. The temperatures are right where they should be for the 9900K. If we had better cooling we may have been able to keep the 5GHz overclock but the temperatures past 85°C is out of my comfort zone. The 9900K is a 95W part. Intel states the Tjunction is set to 100°C, so anything below that should be okay. At 5GHz we hit close to 90°C and that makes me feel like I'm cutting it too close. In this case, I felt like I should back off my overclock or provide better cooling. Power and load conditions also didn’t surprise me here but the Z390 Dark does have a much beefier VRM solution. It offers a massive heatsink design that seems to offer proper VRM cooling while under load. You can see this from the FLIR images. The upper part of the heatsink surrounding the VRM only hit 35.2°C during load. This is outstanding considering I was stressing the VRM & CPU for over 30 minutes. The MOSFETs surround the CPU was warmer but still offered an impressive temperature of only 42.6°C. The PCH/Chipset only hit a max of 33°C. Overall, I am thoroughly impressed with how the Z390 Dark offers proper VRM/Chipset cooling with a large passive heatsink. The heatsink makes proper contact and ensures an efficient cooling process. The way the board is laid out helps with the cooling process because air will move over the top of the power connectors, memory, CPU, and rear panel heatsink. The NVMe SSD performance of the Western Digital SN750 is outstanding. This drive really puts some serious competition out there against Samsung and its 970 EVO. With seq. read speeds of over 3000 MB/s and seq. Write speeds of over 2500 MB/s, you can expect this generation of NVMe drives to push the boundaries. The new WD Dashboard software also offers a “Gaming Mode” which offers a higher power state that offers better latency and higher sustained read/writes. This AIDA64 benchmark shows real-time memory/cache latency and read/write speeds for the TEAMGROUP kit running at 3600MHz. So what do I think of this motherboard? I think this is the best Z390 motherboard I've tested but it comes with a cost of $500.00. its absolute limits, then the Z390 dark is your an excellent choice. less strain on the IMC. The Z390 has a massive heatsink for efficiently cooling its 17 phase VRM. It also sports a 10-layer PCB which enhances stability. I definitely recommend this board for people who love overclocking and it may help you achieve better results. I do feel this board is justified for $500 and if your serious about having the best, then the Z390 Dark is worth the investment. EVGA didn’t have this in stock on their own site but I did find it available on NewEgg for $499.99. Cons: $Cost$ | I’m not going to knock a flame off because you're getting an excellent Z390 board with plenty of PRO overclocking features. Last edited by Jedson3614; 03-02-2019 at 06:02 AM. Great guide buddy! Would love to get my hands on this monster. Nice board but way, way too expensive for what it is. The EVGA X299 Dark is less than $300 right now, for comparison. cinebench is really a really good quick test that will help you chasedown the vcore you need. geekbench3 modded to 64bit is also very good. Last edited by tatmMRKIV; 02-27-2019 at 10:35 AM. IMHO, this board is not the best Z390 board out there. I have lived with this board for about a month, now. It is much more show than go. Do not believe the hype. This board will not improve your scores or overclocking. My scores went lower on this board and was not able to clock what my other board was able to clock at. Your Pro's for this board are Unique layout, which if you are using a PC case, may find it very difficult to work around the 90 degree connectors, the Vrm design, and temperature. What about performance? That is what this board is being advertised as for performance and for "Extreme Overclockers." Running this board with an AIO for testing and imply that if better cooling was used this board may improve performance? Of course it may. Where are the bench test results from people with this board? It would seem some people would love to show off some scores if the board produces as advertised. This board runs fine on a modest overclock. That's it. It's a good board. Nothing special except the nice VRM design and the Unique layout, which sounds cool in theory. As for price, it is not worth 500USD, unless charging this much because other board companies are charging about this much for they're top tier board, than yeah. Extreme Overclockers need not apply, nor enthusiast for that matter. I had really high hopes and lots of time spent on this board and it did not deliver. It does look cool and I really like the DARK Z390 image at post and other things. The information about overclocking in this review is much more impressive than the board itself. Last edited by wwxww; 02-27-2019 at 10:31 AM. Hey, thank you for your input. I personally think this board is great but I can see where your coming from also. Price is pretty high for a Z390 board. Update: I am able to get 4000MHZ on my RAM with 1.4V on VDIMM (18-20-44 timings). I may be going back in the review here shortly to update and throw in cinebench tests. I did have to set SA to 1.25 and VCCIO to 1.3. Hey, thank you for commenting here. Love to interact with you guys and appreciate the feedback. I am going to update the article becuase I did get 4000MHz with 1.4V at 18-20-20-44 timings. I am also going to add in cinebench runs and may move away from these hotter tests. I cruelly have been using PowerMax by CPUID nd like that but it also run hot. It good when people actually comment on what tests they want to see rather than complain with no suggestions. E-Leet is not fully functional for me as a platform. I can open it and monitor stuff just fine but it freezes my PC anytime to make any voltage adjustments. Has nothing to do with my overclock. It happens at stock too. I feel the latest UEFI BIOS may have some bugs to work out. I have VDROOP set close to max (75%) with little drop and my VCore and VID shoot past what I manually set. With 1.25V I see 1.28 under load. It’s acting like adaptive even though I set manually. There is a disable VDROOP but I havn’t tested what that actually does. Seems it may actually allow a static voltage but I havn’t tried it yet. Last edited by Jedson3614; 02-28-2019 at 08:01 AM. Yeah I only use e-leet for monitoring, and other people have also had issues with making adjustments from it. you should check out the evga forum for info on the vdroop. the evga bios is not like other setups. I'm sure this is a great board by EVGA, they've certainly put much effort into making the board. However, to state "I think this is the best Z390 motherboard you can get" without testing the competition for comparison is taking quite some liberty.